Wednesday, 30 April 2014: SriLankan Airlines' addition to oneworld® at midnight tonight is being celebrated by a special double miles offer for frequent flyers. The 300,000 members of SriLankan's FlySmiLes loyalty programme will receive twice their usual FlySmiLes miles when flying on most oneworld partners between 15 May and 30 June 2014. Similarly, members of most established oneworld airlines' loyalty programmes will receive double the normal mileage awards/points when flying on SriLankan during the "welcome" period. Fellow Asia-Pacific airlines Cathay Pacific, Japan Airlines, Malaysia Airlines and Qantas. From the Middle East, Qatar Airways and Royal Jordanian. From Europe, airberlin, British Airways, Finnair, Iberia and Russia's S7 Airlines. From the Americas, American Airlines, now also including US Airways, LAN Airlines and TAM Airlines. Together as part of oneworld, these airlines serve almost 1,000 airports in 150 countries, with 14,250 daily departures. The special frequent flyer offer was announced today on the eve of SriLankan becoming part of oneworld – as the first carrier from the Indian sub-continent to join any global airline alliance. From 0001 Colombo time tonight, cardholders in SriLankan's FlySmiLes programme will, in effect, have their frequent flyer privileges extended to apply whenever they fly with any oneworld member airline – including earning rewards and tier status points plus the ability to redeem rewards for flights throughout the alliance network. New frequent flyer membership cards, bearing the oneworld logo, are being mailed to them to ensure they receive the benefits to which they are now entitled when they fly with any oneworld airline. FlySmiLes Platinum cardholders will have the top Emerald status in the oneworld programme. This entitles them, plus one accompanying guest, to use more than 600 airport lounges worldwide offered by oneworld member airlines when they fly with any of the alliance's carriers, even in Economy Class. As oneworld Emeralds, they can use First Class lounges, where available. oneworld is the only alliance to offer these most loyal customers access to First Class lounges when they are not booked to fly in the First Class cabin. They can also now check-in at the First Class counters of oneworld airlines, even if they travel in Economy or Business Class. They will also be offered additional baggage allowances and access to fast track through security checks at airports where fast track is offered. 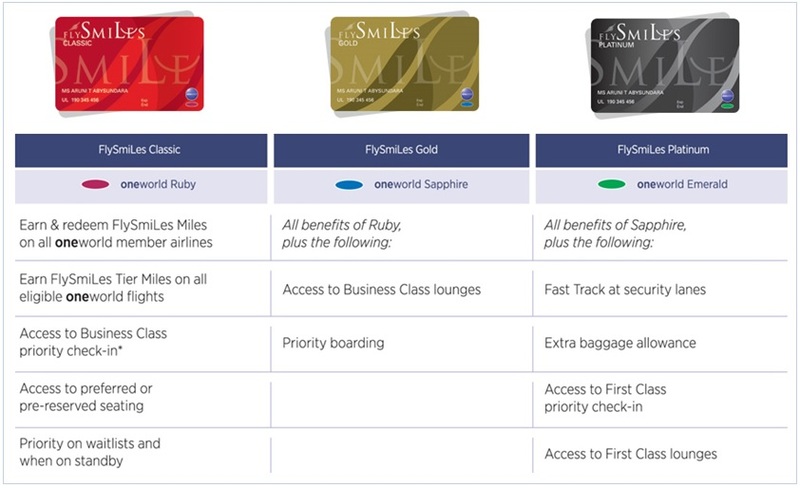 FlySmiLes Gold members will be equivalent to oneworld Sapphire, entitling them to use Business Class or frequent flyer lounges offered by oneworld's member airlines worldwide accompanied by a guest when they travel on any oneworld flight, no matter in which class they are booked. oneworld Emerald and Sapphire frequent flyers are also invited to board any oneworld airline's flight at any time they choose before the boarding gate closes, rather than wait for passengers in the cabin in which they are booked to be called for boarding. FlySmiles Classic members will have oneworld Ruby status. Like oneworld Sapphire members, they will generally be able to check-in at Business Class desks when they depart on any oneworld flight, irrespective of their class of travel. All three oneworld tiers – Emerald, Sapphire and Ruby – also offer priority standby and waitlisting on any oneworld airline, if the flight they want to travel on is fully booked. In addition, cardholders can pre-reserve their preferred seat on any oneworld flight, whenever this service is available. Also from tonight, members of the established oneworld airlines' frequent flyer programmes will be able to earn rewards and tier status points and receive all other oneworld benefits when flying on SriLankan and redeem rewards for flights on the airline.